Interior designer Amy Lau opened her eponymous studio in 2001, and has since built a reputation for crafting sophisticated spaces that effortlessly mix midcentury classics with today's design standouts. The New Yorker met up with us this week to share her design forecast for 2015, tips for balancing vintage and contemporary pieces, plus her dream-come-true design project. A Tribeca Triplex designed by Amy Lau. Photo by Bjorn Wallander. AC: Which designers, vintage or contemporary, do you foresee having a moment this year? Who’s going to really stand out in 2015? AL: The way that Gareth Neal approaches the intersection of historical and modern design is very unique. His work blurs the line between forms of the past with the most of-the-moment technologies, and his pieces appear to be in motion or change based on your perspective. I find Joris Laarman’s 3D-printed furniture captivating; the studio intentionally looks to nature for inspiration in formulating these cutting edge designs. Their unprecedented work looks decidedly freeform, expressive, and artistic, yet the basis of the forms are firmly rooted in science. I find this juxtaposition fascinating. The Haas Brothers are exploring some really unique materials and techniques in their work, and Nendo is just so creative and prolific, constantly churning out truly innovative work. 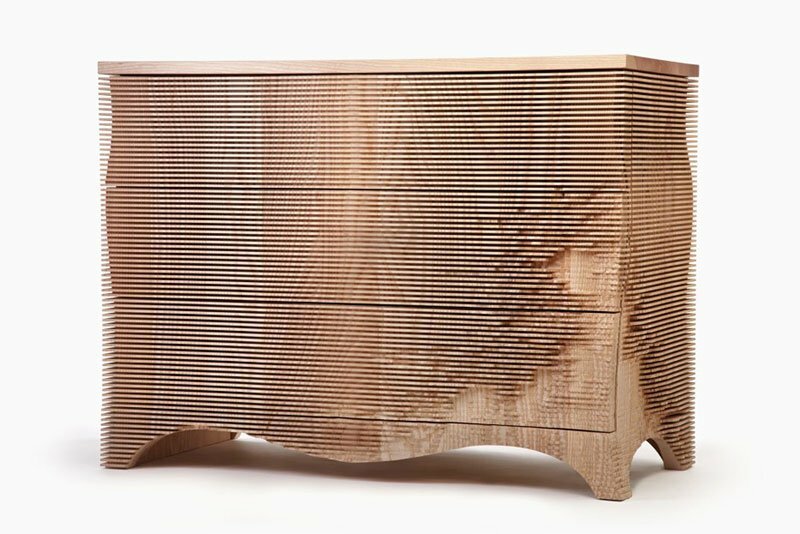 George III Chest of Drawers by Gareth Neal. Photo courtesy of Gareth Neal. AC: Are there any specific designers you personally have your eye on right now? Anyone you'd especially love to highlight through 2015? AL: Scholten & Baijings are total experts in color mixing—with the perfect level of restraint. The variety of materials they creatively apply their signature pops of color to is really exciting. They make it easy to incorporate color in the home in unique ways with their fun, super vibrant accessories. India Mahdavi is just the consummate artist. She always offers a fresh take and her work is as refined as it is distinctive. She has an innate sense of material, color, and form, and intelligently combines them to exceptional results on a regular basis. AC: How would you describe your approach to combining vintage and contemporary pieces? How do you achieve a sense of balance? AL: It is important to have a dynamic mix of vintage and contemporary pieces in a home as it helps the space to feel personalized and unique. A sense of balance can be achieved with seemingly disparate furnishings, fixtures, and accessories by filtering your selections through the lens of a distinct color palette—making sure your woods, fabrics, metals, and other finishes all harmonize. This stops the mix from looking jumbled and keeps it feeling intentional and well-curated. Tribeca Triplex designed by Amy Lau. 1950s sofa by Kagan; cocktail table by Based Upon; rug by Kyle Bunting. Photo by Bjorn Wallander. Photo courtesy of Amy Lau. Tribeca Triplex designed by Amy Lau. Photo by Bjorn Wallander. Chandelier by Lindsey Adelman. AC: Your dream project (which, of course, involves limitless resources and space), would absolutely include work by which designers? AL: I am proud and excited to be creating my dream project as we speak. We are currently working on Maviar, a high-end home furnishings and design showroom as well as a palace in Riyadh, Saudi Arabia. I am utilizing works of some of my favorite contemporary and vintage designers for both of these projects. For sculptural seating, I am tapping Vladimir Kagan, a dear friend and design legend, for his innate sense of form and function. For unique, artistic lighting, I am joining forces with Lindsey Adelman, who is able to create fixtures that straddle the line between light and art—allowing me to add special, glowing jewelry to the walls and ceilings. Silas Seandel is creating bespoke tables, sculptures, and mirrors in organic shapes that will take form in a sparkling variety of metals and finishes. Vintage masterpieces by visionaries Gio Ponti, Ico Parisi, Osvaldo Borsani, and Franco Albini will be re-imagined with a selection of luxurious, jewel-toned fabrics—and the entire space will come to life enveloped in custom-made artistic wall coverings by Maya Romanoff. AC: Tough to top that, Amy—we can’t wait to see the final results! Amy Lau portrait by Mark Seliger. Photo courtesy of Amy Lau.